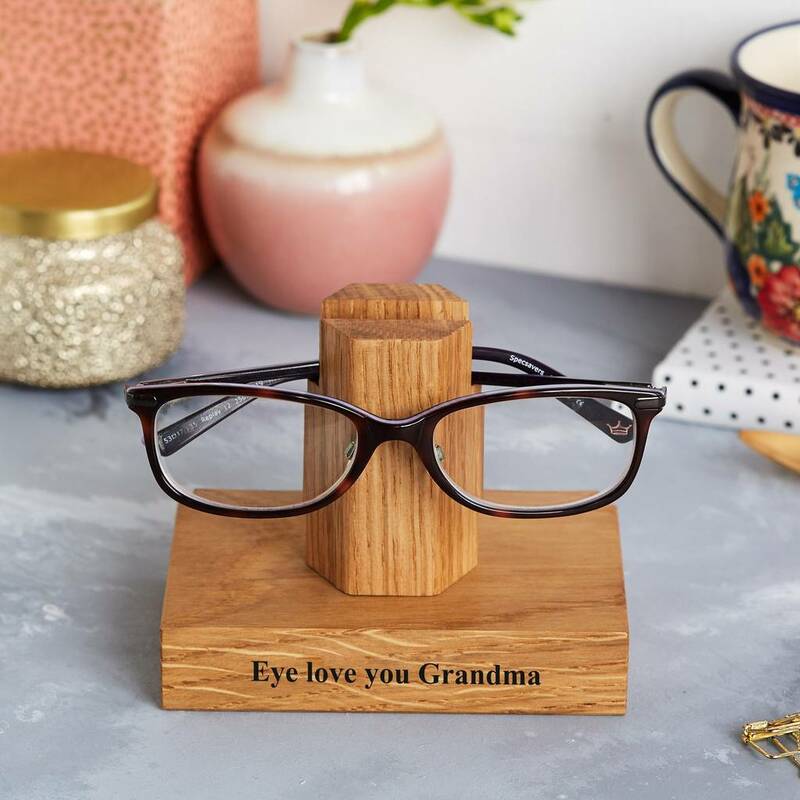 The perfect personalised Mother's Day gift for her; a special Grandma, Nanna, Mum, Sister or Auntie who is always misplacing their spectacles or glasses? 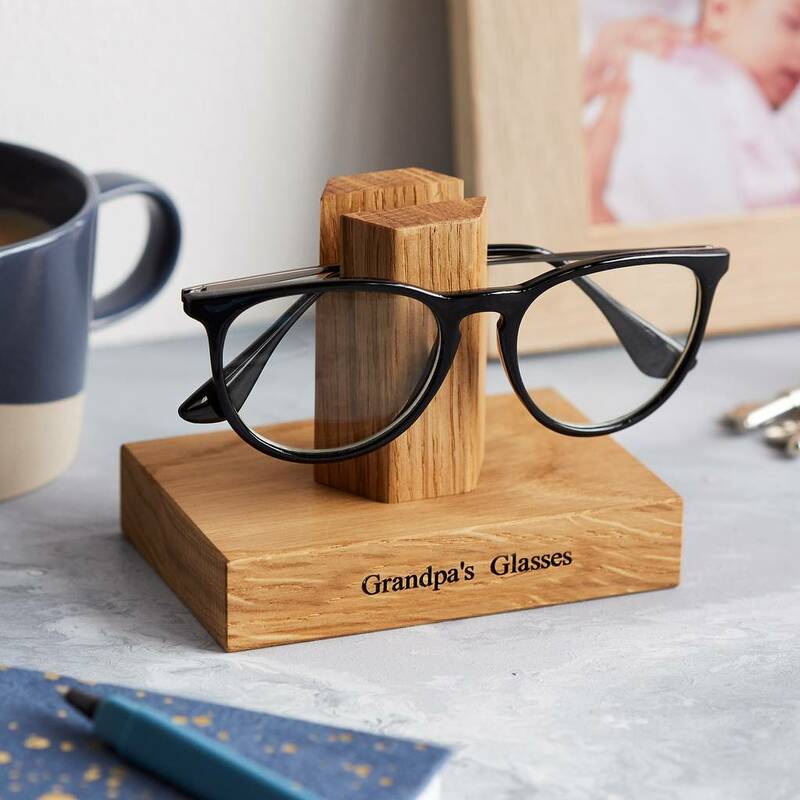 Also perfect for a 5th wedding anniversary or birthday and a very thoughtful gift when bought in pairs for those cherished Grandparents or Mums and Dads. 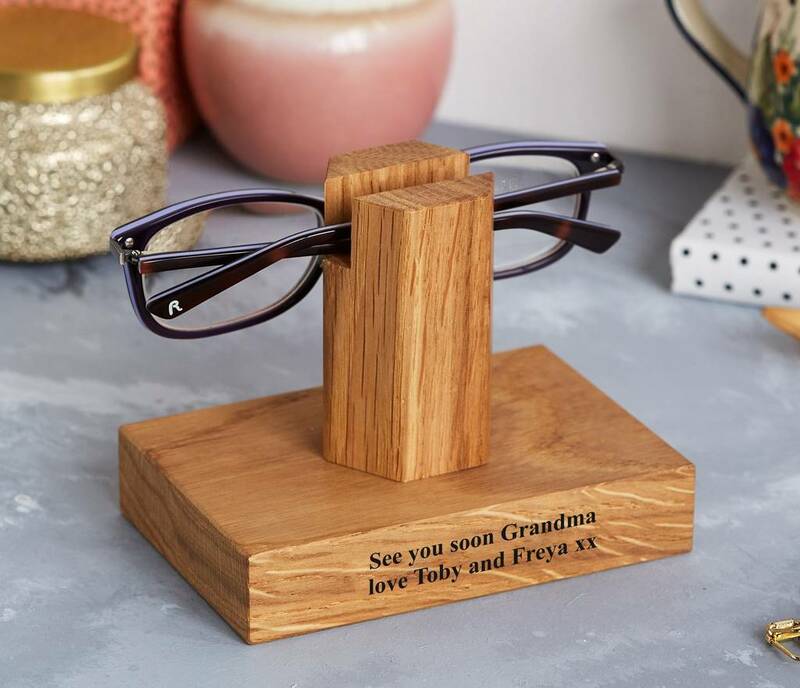 Made extra special with loving or funny personalised messages on the front and back. 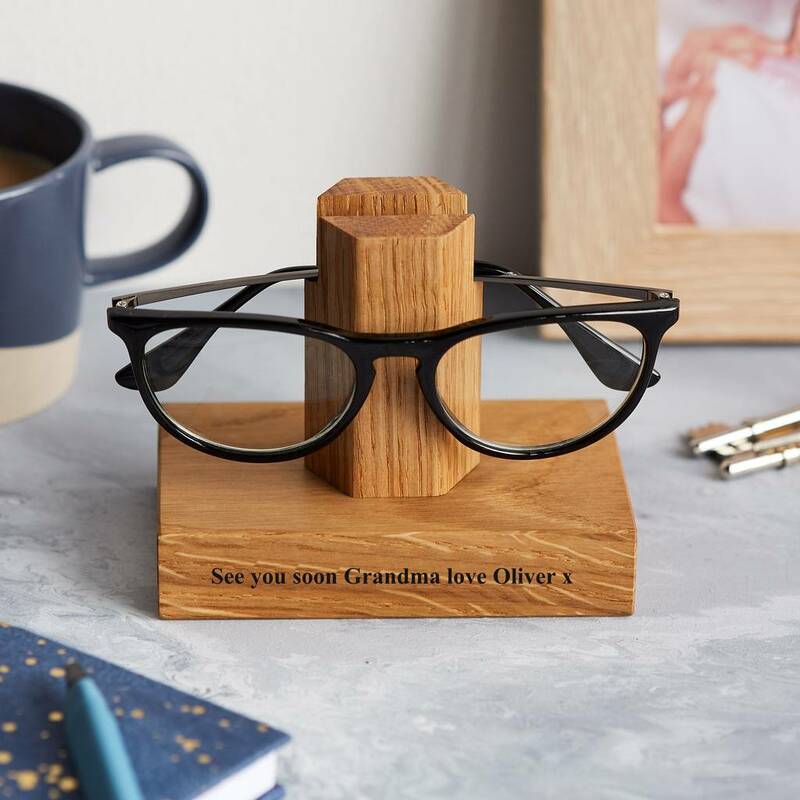 Hand made from solid oak, lovingly crafted in our workshop in North Wales our personalised glasses stand is the perfect place to keep those precious spectacles or glasses safe, on the office desk or by the bedside at night. 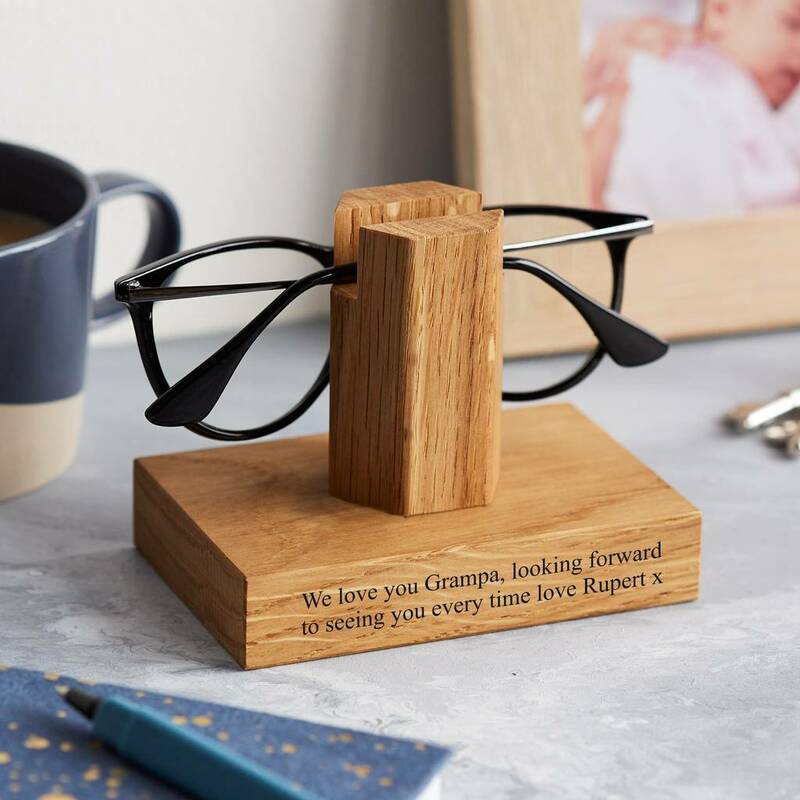 You can add a message on the front (up to 40 characters), and on the back (up to 80 characters) making it a perfect keepsake gift for many years. 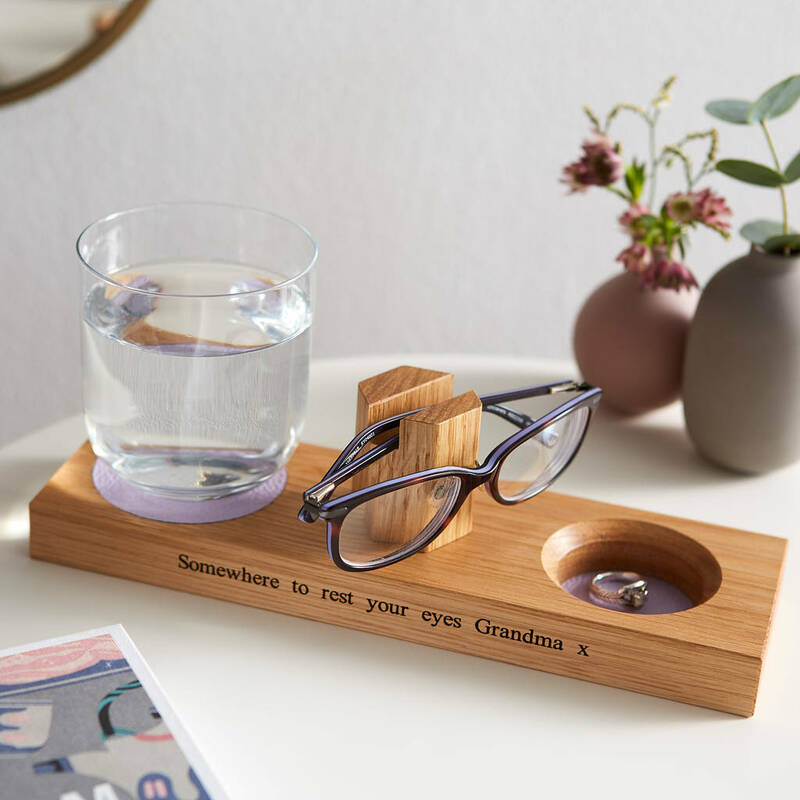 You can choose a double glasses stand or one with a coaster and tray both lined with grey or lavender coloured leather. 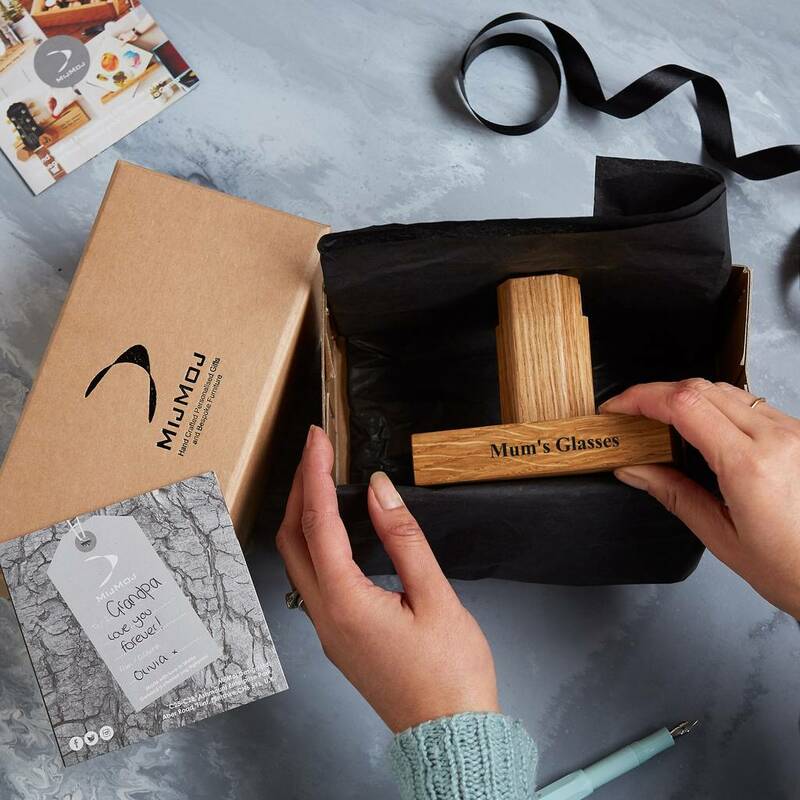 You can also choose to complete your gift with our Kraft gift box and black ribbon. 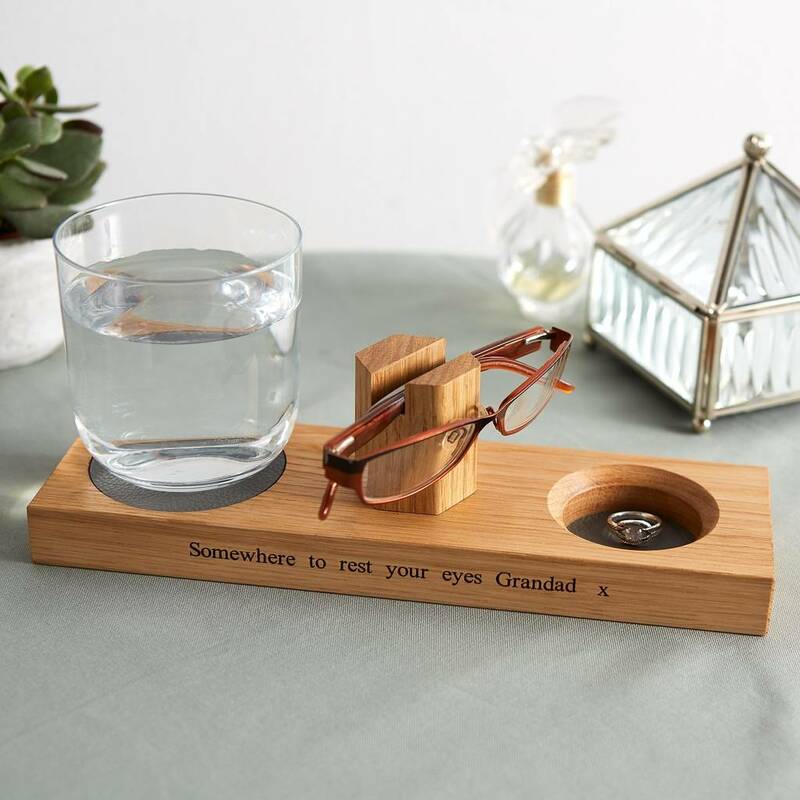 Suitable for most types of glasses, the stand securely holds the glasses by the arms which sit neatly in the slot on the top of the hex column when folded. 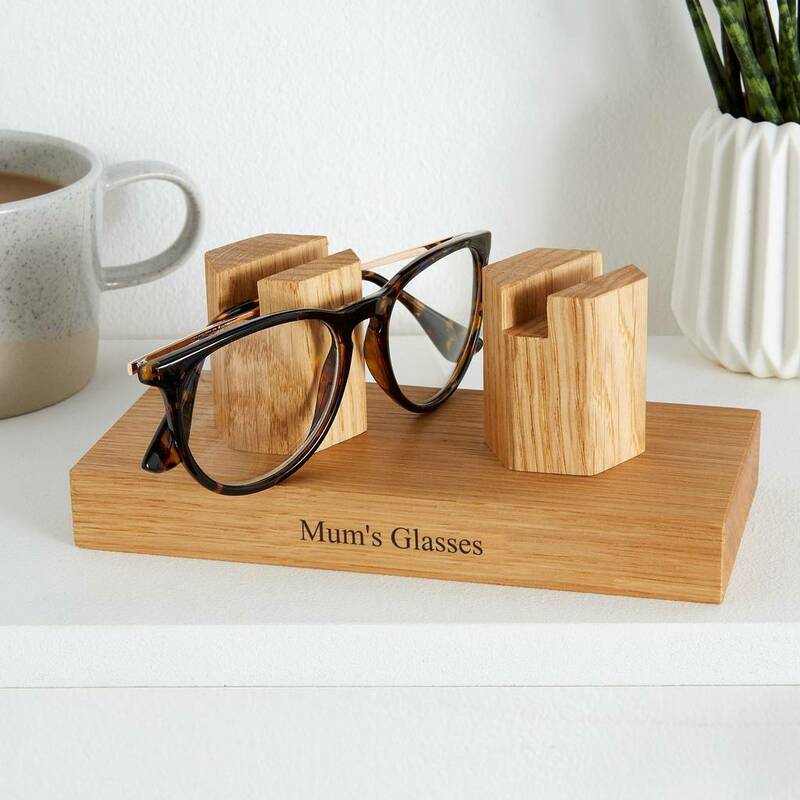 Solid natural oak with laser engraved detail and lovingly finished in enhancing oil. Grey or lavender leather. 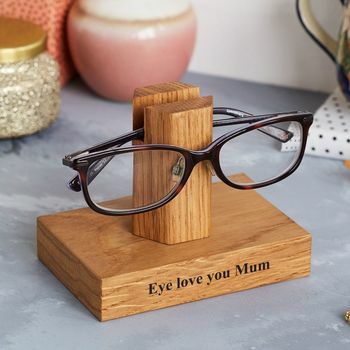 Single glasses stand: 120mm (L) x 80mm (D) x 75mm (H) approx. Double glasses stand: 180mm (L) x 80mm (D) x 75mm (H) approx. 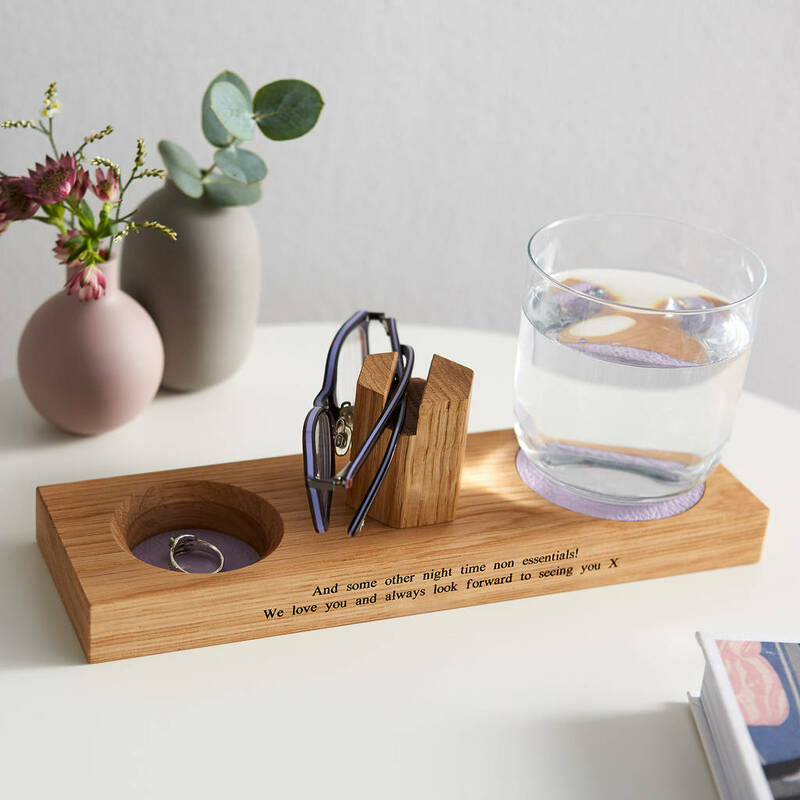 Single glasses stand with coaster and tray: 260mm (L) x 80mm (D) x 75mm (H) approx. 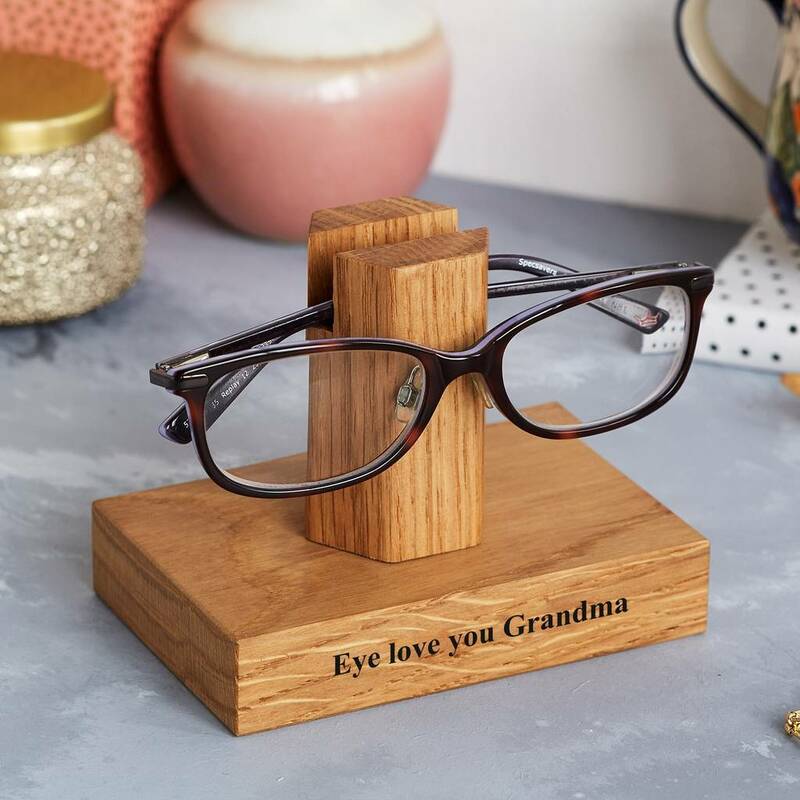 This product is dispatched to you by MijMoj Design.